Farmers depend on steady electricity supply to water the crops. They have pumps, which draw water and spread it on the fields. Due to shortage of power supply, many have to suffer from losses. The state government of Punjab has come up with a unique scheme that will enable farmers to save water and earn money for every unit for electricity they save. It will in turn cut down power shortage in the state. The Pani Bachao Paise Kamao Scheme is targeted towards proper utilization and conservation of water and electricity. 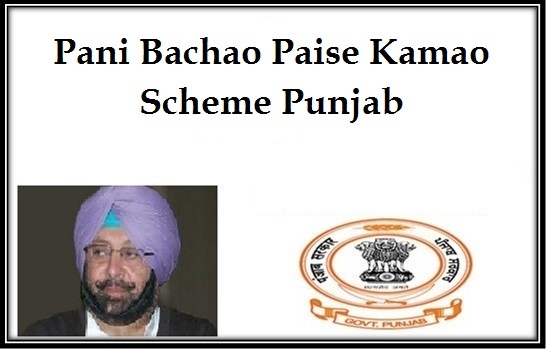 The ‘Pani Bachao, Paise Kamao’ scheme or the Save Water Earn Money project has been announced by the Punjab state government on the 14th of June 2018. For the time being, it will be implemented on pilot basis. No compulsion of any type – It is not compulsory for all agricultural workers to join this scheme. If any applicant is interested in taking part in this, he will have to register voluntarily. Installation of meter by state – Once any agricultural workers enrolls under this projects, it will be the responsibility of the Punjab government to install meters on the pumps. This meter will record the amount of water the farmers are saving. No fee for the farmers – The scheme states that all those agricultural workers, who desire to earn money under this scheme will not have to worry about the payment of bills. Extra electricity supply – The state has mentioned that those people who will enroll under this water saving scheme will get two hours of extra power supply. Otherwise, electricity supply will only be done by the state, for farmers during daytime. Subsidy per unit power – The farmers will receive Rs. 4 for every unit of electricity that they save. Money in bank account (DBT) – The money will be transferred by the state government into the bank account of agricultural workers. Thus, it is mandatory for them the farmers to have bank accounts. Pilot scheme – The scheme will be implemented on pilot basis, and the state will set up 6 feeders. These will be done in the following districts – Jalandhar, Fatehgarh Sahib and Hoshiarpur. Specific limit of power – The state will fix an optimum limit of power that every farmers will be expected to use each day. No fine for crossing the limit – In case any farmer consumes more that the specified electricity amount, the state will not take any additional fee from them. It will be given to them for no extra charges. Development of state and farmers – The success of this scheme will be able to bring about overall development and progress in the agricultural sector in Punjab. If the state sets the power consumption limit at 1000 units for each day, but the farmer only make use of 800 units each day, then the subsidy will be calculated accordingly. The difference of the two numbers will give the amount of units the farmer saves (1000 – 800 = 200). For each unit, the farmer is entitled to get Rs. 4. So, he will receive Rs. 800(200*4). If he is successful in doing this for 30 days, then at the end of the month, the state will transfer Rs. 24,000 into the bank account of the farmer.